SpotProtect is a WiFi cloud based multi function remote monitoring and alert system. Battery powered sensors detect water leaks, temperature extremes, motion, security sensors, driveway alarms and more. Alerts are sent via email or text message. SpotProtect WiFi sensors monitor environmental conditions, entrances, assets and more. SpotProtect sensors communicate their readings back to the local router via the existing WiFi network. All SpotProtect sensor readings are logged within the cloud protect server. 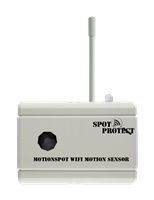 The appriate personnel are notified via email and/or text message when a SpotProtect sensor detects a reading outside of the user defined “normal” conditions.